Life is hard enough in 18th-century France, and few know that better than Camille, who’s been forced to take care of her younger sister and older, alcoholic brother when their parents pass from smallpox. She uses small magics to convert scraps into coins, but they’re barely making ends meet when Camille finally decides to explore a side of magic her mother always warned her away from — a type of ‘la magie’ that can change her very appearance, and win her a ticket into Louis XVI’s palace in search of riches and safety. As a reviewer who reads so much YA fantasy, I find that it’s rare to come across a plot that is as unique and fresh as Enchantée. The setting alone is a rarity, but when you add in the aristocratic players such as Louis XVI and Marie Antoinette, coupled with la magie and Camille’s responsibility to her family, it’s easy to see that Gita Trelease has crafted a genuinely original and creative story here. Little by little, magic was erasing her. Sometimes she felt it might kill her. Camille is unique in her own rights, too; she’s got a level head on her shoulders because she’s been forced to grow up so fast, but she wears her responsibilities sensibly and with a quiet acceptance. Rather than railing against her circumstances or trying to find an escape, she’s committed every ounce of her being to protecting her younger sister and keeping them safe and sheltered. She’s an easy protagonist to like, and she feels authentic; despite her commitment to her sister, she still allows herself to dwell occasionally on how hard her life is or how much she wishes certain things would change. She hated la magie ordinaire, but it was all she had. I was also immediately impressed by the quality of writing in this story. Gita Trelease is a total natural and she paints beautiful scenery. Her storytelling is lush and imaginative, with rich details. Unfortunately, it was almost too richly detailed at times, and that’s where my struggles with this book began. Despite all of the positives I mentioned above, the problem I had with Enchantée is that this book is a little too long. It had potential to be a quick-moving, well-paced plot full of action and intrigue and the occasional suspenseful thrill, but instead, so much time was spent focusing on the opulence around Camille that, while it paints a pretty picture, it’s hard to stay very invested in the goings-on. Though she’d tried so hard to hold it all, in the end it ran away like water through her fingers. Nothing stayed. 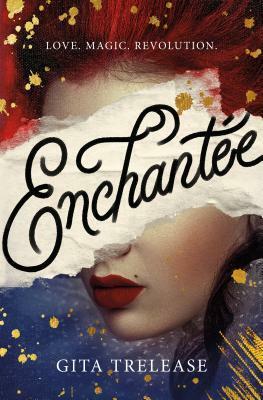 While Enchantée wasn’t a perfect score for me, I honestly believe it’s a ‘me, not you’ situation, because this book has massive potential to be so many people’s favorite release of the year, and I mean that with every fiber of my being. I actually fully intend to reread this at a later date (when I’m not struggling with the final vestiges of a reading slump), because I think, had I been able to move past the slow pacing, this would’ve been an easy winning title for me. I highly recommend anyone who enjoys historical fantasy to check this story out, because I believe it’s going to be a massively successful release, and I can’t wait to watch Gita Trelease blow us all away. All quotes come from an advance copy and may not match the final release. Thank you so much to Flatiron Books for providing me with this ARC in exchange for an honest review! Be sure to check out the other blog tour participants’ posts and reviews for more information on this exciting new release! DESTINY! YOUR REVIEWS ARE SO GOOD. I was really looking forward to this book (& kinda still am?? ), but I struggle so hard with fantasy, especially slow-paced. Let me know when you reread it, because maybe I can join you! Ugh I love you Bex 😭💕 thank you!! I definitely will let you know! I have an ARC of this book to read on my TBR. I love your reviews! I’ve been on a fantasy kick since last fall and just can’t get enough. Thank you so much! I hope you enjoy this one 🙂 I’m ready to get back in a solid fantasy mood. It seems like for the last several months I keep finding myself alternating between horror and contemporary moods but my fantasy TBR is a million miles high! I’m currently reading an eARC of this, and it is definitely a little slow! But I think I’m finally getting to the part where it picks up, and look forward to the rest. Oh, good! Did it pick up a lot for you? I’m about 40%-ish in and it’s still a bit slow, but I’m just really enjoying the magic. There’s a bit of surprise, which makes me keep wanting to read it to see what this particular person will do. Thank you so much! ♥ I can’t wait to hear your thoughts! Love your review! I found it a bit slow too…..but loved Lazare!!! I just bought this and this post has me super excited to get it started! Can’t wait. This is definitely going on my TBR in April! I can’t wait!!!! Awesome!! I hope you enjoy it!